HONIARA, 10 April, 2019 – The first FFA-led monitoring, control and surveillance operation for the year - Operation Rai Balang (OPRB19) ended on 29 March, finding only six infringements. BANGKOK 22 February 2019 – The Pacific Islands Forum Fisheries Agency (FFA) was awarded the top prize in the 2019 Stop Illegal, Unreported and Unregulated (IUU) Fishing competition yesterday. Forum Fisheries Committee endorses a 5 year Regional MCS Strategy to further reduce IUU fishing in Pacific tuna fisheries. August 15th 2017, FFA HQ, Honiara SOLOMON ISLANDS—Investigations into four serious breaches of vessel fishing licenses have opened up after another regional fisheries surveillance sweep in the Pacific tuna fishery. FFA HQ, Honiara, SOLOMON ISLANDS – There were no apprehensions and no blue boats, but the annual fisheries surveillance sweep of the Polynesia sub-region still served up a round of interesting highlights for 2017. 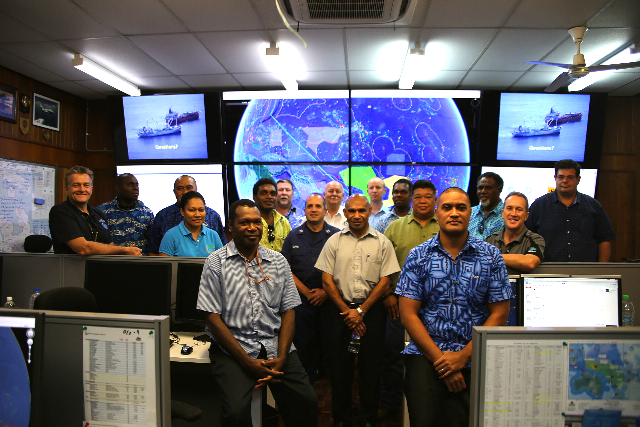 Coordinated by the FFA’s Regional Fisheries Surveillance Centre, Operation Tui Moana ended its ten-day run on Friday 26th May. Monday 20 June 2016, FFA HQ, Honiara SOLOMON ISLANDS-- A blend of Foreign Affairs, Law Enforcement, Finance and Fisheries Ministers from nine Pacific Islands Forum Fisheries member nations are leaving Honiara this weekend expressing their overall satisfaction with the status of regional systems for monitoring, control and surveillance and with an active interest in the impact of Fisheries on their own portfolios. 22 April 2016, FFA HQ SOLOMON ISLANDS – Building on recent firsts in previous fisheries surveillance operations, Operation Rai Balang 16 saw the successful surveillance and apprehension of three Vietnamese ‘blue boats’ poaching for reef resources in the EEZs of FSM and Palau.